The IDX NPS-742 Battery and Power Kit consists of four NPL-7S batteries, JL-2P Charger and Power Supply and a 10' DC Power Cable. 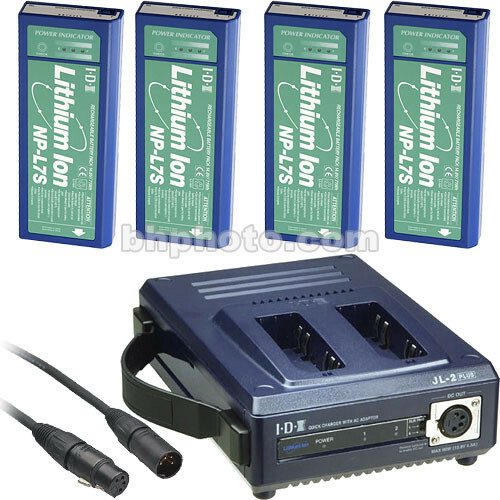 This kit will supply power to a camcorder, monitor or other equipment utilizing AC adapted power or DC battery power. The JL-2PLUS is a compact, two-channel, sequential multi-chemistry fast charger with a built-in 60W power supply. Up to two NP-Style batteries can be charged in approximately 3 hours. The primary use of this unit is as a charger, and you can charge batteries or use it as a power supply, but you cannot do both simultaneously. The charger includes a removable AC power cord. The JL-2PLUS offers a lightweight design (3.3 lbs) with a convenient built-in handle. The JL-2PLUS is designed to directly charge NP-Style batteries. Since the NP-Style mount is one of the most common battery mounts on broadcast and professional camcorders, IDX has adopted the design to help fit that need. An LED condition indicator is offers a quick glance of each battery's charge status. An all-metal case construction ensures that the JL-2PLUS will hold up under the harsh rigors of location shooting. Any combination of battery chemistries can be automatically charged with the JL-2PLUS. This is a simple charger that will charge either Ni-Cad or Li-ion batteries, but it does not contain charging protocols to drain the batteries before charging. Ni-Cad batteries should be drained to the proper voltage before charging to avoid the memory effect. A standard 4-Pin Canon type connector is available on the front panel to provide 60 watts of DC power via the built-in power supply. As with all IDX chargers, the JL-2PLUS's power switch is recessed to prevent an accidental loss of power. A worldwide, auto-sensing AC power (AC 100-240V) operation is standard. The IDX CA-4XLR is a 10' 4-Pin XLR power extension cable. It features a 4-Pin XLR male connector on one end and a female 4-Pin XLR connector on the other end. This allows the user to extend the distance between the power source and the equipment an extra 10'. Box Dimensions (LxWxH) 9.9 x 9.45 x 3.65"
Box Dimensions (LxWxH) 7.45 x 2.85 x 1.05"
Box Dimensions (LxWxH) 8.1 x 6.35 x 1.9"